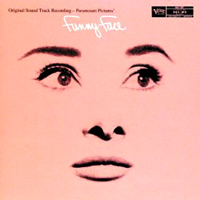 Film Soundtrack, 1956 (Verve) (5 / 5) One of the most fashionable films ever made is the classic Funny Face starring Fred Astaire, Audrey Hepburn, and Kay Thompson. Highlights from the score of the Gershwin brothers’ Broadway musical of the 1920s, in which Astaire had starred three decades earlier, are inserted into a new plot and augmented with a trio of up-tempo numbers by composer-producer Roger Edens and lyricist-screenwriter Leonard Gershe. We know that this is a terrific recording as soon as Astaire’s unmistakable voice launches into the title tune on the first track. Not much later, Thompson socks out the Edens-Gershe showstopper “Think Pink.” Hepburn offers a deeply felt, subtle reading of”How Long Has This Been Going On?” Astaire’s ballad “He Loves and She Loves” is given an equally uncluttered and sincere rendition. 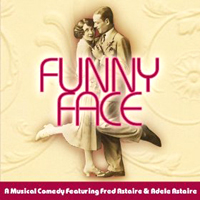 The soundtrack album also boasts some delightful duets: Thompson and Astaire’s “Clap Yo’ Hands” and Thompson and Hepburn’s “On How to Be Lovely.” Especially apparent without the film’s visuals to distract the eye is the brilliance of the writing/arranging in the star trio’s extended musical sequence “Bonjour Paris.” The songs have been fitted with perfect orchestrations by Alexander Courage, Conrad Salinger, Van Cleave, and Skip Martin, and the entire performance is crisply conducted by Adolph Deutsch. In the words of Ira Gershwin as heard in the recording’s final track, “‘S Wonderful! ‘S Marvelous!” — M.S.